too lazy to search for native food in the sweltering heat this morning, i tripped next door to the chinese-owned cafe and had an american-esque breakfast. it was accompanied by malaysian coffee, which is curiously sweet and has a deep nutty flavor almost like chicory. i was enjoying this cup over the (ridiculously overdramatic) chinese soap opera on the overhead tv, when i was approached by a chinese man named ang. he was sort of an idiot savant.... meaning he was exceptionally smart but not able to communicate it very well despite his good english. he works as a tour guide and i felt a sales pitch coming on, but instead he invited me to go down the street to the hainan temple with him and he would show me around for free. so i went. the hainan temple is gorgeous. 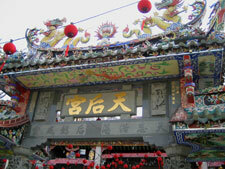 he explained to me that chinese temples are more like social clubs than places of worship. this one had been handed down through the generations by his “klan”. old black and white pictures of them lined the walls. he took me upstairs to the ancestral room, where they believe the souls of their dead relatives can be conjured. they make a tablet (similar to a headstone) with the person’s name painted on it in beautiful chinese calligraphy, and it often has a small picture of the person as well. they burn incense and leave offerings of fruit and sweets to tempt them to come often and feel comfortable. ang swears if he concentrates long enough on his grandfather, he can feel him sitting in the nearby chair. next we went downstairs, where there were two main rooms. one is the actual temple room and one is a school where they teach the chinese opera and the lion dancing. the main room had 4 small alcoves, each with altars to different gods and goddesses. red is the predominant color, which chinese believe to be auspicious. to be honest, i have no idea which religion this was, but i am guessing buddhist. there were also elements of taoism, including the attention paid to feng shui, by balancing the position of the female goddesses with the male gods. there were huge golden stupas in the two front corners, covered in amulets with written names on them. ang told me that the stupas point towards the heavens. people come to make wishes or say prayers, leave their amulets behind, and send the energy up the stupa into the sky. ang insisted that the chinese are not especially religious. he said a lot of their gods were mere mortals, who are worshiped as models for their bravery and wisdom. he said chinese people don’t so much pray as they do come to exchange energy with a certain god who might feel most relevant to their life at that point. “energy” is a recurring theme. they do believe to a certain extent in actual spirits though, hence the many offerings laid out at every altar. several wrinkled and toothless old ladies hobbled in to light incense, shake a weird can of sticks (i forgot to ask what this was for), and burn candles to the goddess of wisdom or the god of the sea. ang led me outside, where he pointed out the gorgeous and intricate carvings of different myths which covered the walls. then it was time for his sales pitch- he wanted to take me on motorbike around the city to see various sites- the beach, the snake temple, the botanical gardens. he told me to call him at 3p if i wanted to go, and otherwise i could meet with him at 7p to go with him and another traveller to a chinese new year’s celebration dinner and lion dance. i set off in the horrid heat towards the penang museum and art gallery, not far away, dodging uniformed high school boys with the propensity to stare openly, and the whistles and waves from older men on motorbike whose heads kept whipping around to catch another sight of the solo white girl. the museum was small but to me, fascinating and definitely worth seeing. (it was also thankfully air conditioned.) 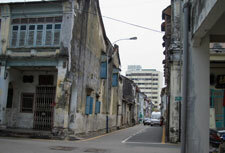 penang is a blend of three very prominent cultures- chinese, indian, and muslim malaysian. they each have their own unique history, their own food, their own clothing, and their own customs. even their own unique buildings! it was interesting to see the different approaches to living, and fascinating that these 3 very different sets of people can all live together with virtually no tension at all. as ang had said, on one street you might hear the muslim call to prayer and see the men in white with their pointed caps and the women covered in headscarves heading out of the coffeeshops towards their mosque. simultaneously you might see indian women dressed in saris and carrying baskets of samosas headed for the hindu temple, or you might see an old chinese man lighting the huge sticks of incense that stand in front of their dark wooden shophouses, and painting watercolors while his wife plays mah-jong at the temple. it’s really a wonderful mix, and i love the diversity. my favorite thing in the museum was an installation that showed each culture singing a traditional nursery rhyme. the chinese one was great, and if i can find a copy of it online i will post it here. i spent so much time at the museum that i didn’t have time to go meet up with ang again for the 3p tour. so i decided to wander through georgetown despite the heat. i peeked my head into the shops along the way- fragrant chinese herbal apothecaries, beautiful indian batik paintings, malaysian antiques. there were also many street stalls filled with cheap clothing and kitchenwares, as well as various foods and fruits. everywhere you go is the smell of incense, the sound of the rickshaw bikes tinkling as they pass. i walked towards the ‘komtar’, supposedly the biggest mall in the area. i was confused to find it half desolately empty, and filled with a lot of frankly cheap crap. yet there was a mcdonalds in the back doing brisk business. i didn’t stay long, heading towards the 7-11 for doritos (!) and tea and back to my room to pass the rest of the hot day reading in my room under the a/c. at 7p i went to meet ang, who showed up annoyed at me and cancelled our trip, i think out of spite because i hadn’t joined his earlier tour. i felt a little bit bad and also a bit disappointed, but shrugged and left, remembering his own advice that it is hard to get close to a chinese person with anything but a blood tie or money. i had the inclination to go see the other side of penang, near the beach, but was reluctant to catch a taxi in the dark (i have a recent fear of taxis), so i wandered down to the bar i had been at yesterday to drink a beer and think. it turned out they were screening ‘aviator’, and being a leonardo fan i decided to watch it. i thought it was a horrible movie, and overlong. in fact, it didn’t end until well past 12am. i left to find the streets mostly deserted, except for the occasional painted, panting transexual prostitute fanning herself in the shadows, and the loitering men in cars. penang has the most sinister undertone to it at night that i ever remember feeling in any country (except maybe costa rica). i was not happy to have to walk the dark sidestreets home alone. i looked around and saw an older european guy heading down my street (who also looked rather nervous), and ran to catch up to him. i walked behind him most of the way, but soon overtook him and was again by myself. out of nowhere a white van with dark tinted windows showed up and slowed, following next to me the rest of the way to the doorstep of my hotel. i glared at the invisible driver and ran in to my room to sleep safely.